From the Community Christian Church blog, Kansas City Mo. 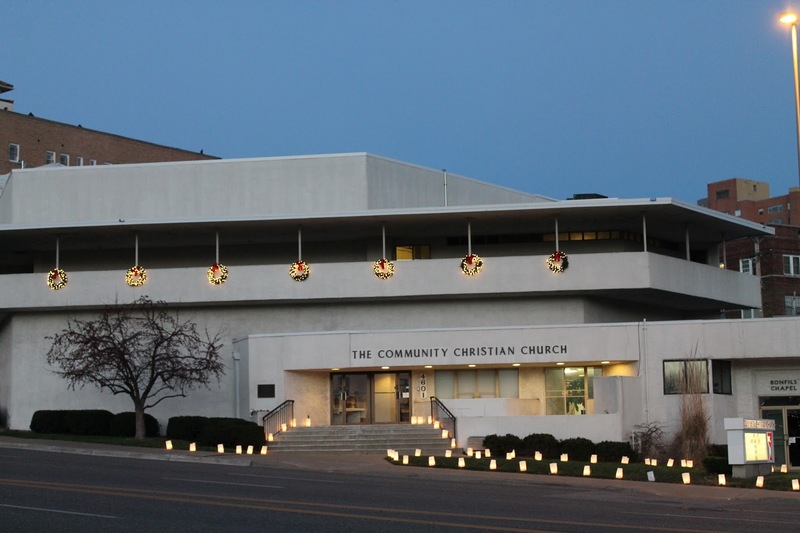 Frank Lloyd Wright, world renowned architect, was commissioned to design the new building for Community Christian Church after fire destroyed the original building on Linwood. Wright envisioned the entire lot being devoted to parking with the church building supported on graceful pillars over the parked cars. The building would front on 46th Street with the main level of the church to be near the street level at that point. Entrance to the parking facilities, in all probability, would be made from the south and west. Plans included a 1,000-seat auditorium with accommodations for a Sunday School of more than 700. Also included were a roof garden to be used for entertainment and other church functions, as well as a radical approach in construction of heating and cooling systems. Wright was considered a genius by some in the architectural world, a faddist by others. He was known for his complete departure from the ordinary and it was expected that the new church building would be no exception. “What?” one member as to exclaim later, “A building on stilts? Why, it might get to rocking and lull some of the church members to sleep.” Wright dispelled any ideas of a building “on stilts,” hinting that the pillars he was suggestiong would be similar to the mushroom-shaped supports on a $1,000,000 office building in Racine, Wisconsin. The idea of air-conditioning for the building was met with much disfavor from Wright. “Why, I’ve gotten more colds in so-called air conditioned buildings than any other place,” he exploded. He went on to explain that the building he envisioned would be comfortably cool in the summer and warm in the winter using a floor heating and cooling system, the floor being heated or cooled as the season demanded, gravity taking care of the rest. He also suggested removable pews in order to give the auditorium capabilities for varied uses. Burris_and_FLWWright presented his finished plans to the building and finance committees in June 1940. Parking for 150 cars was allowed; construction of the building would be of steel and rose-tinted concrete. A green copper dome would sit above the chancel area. Wright claimed the building would be fireproof, earthquake, and vermin-proof” and upkeep would be virtually nil. 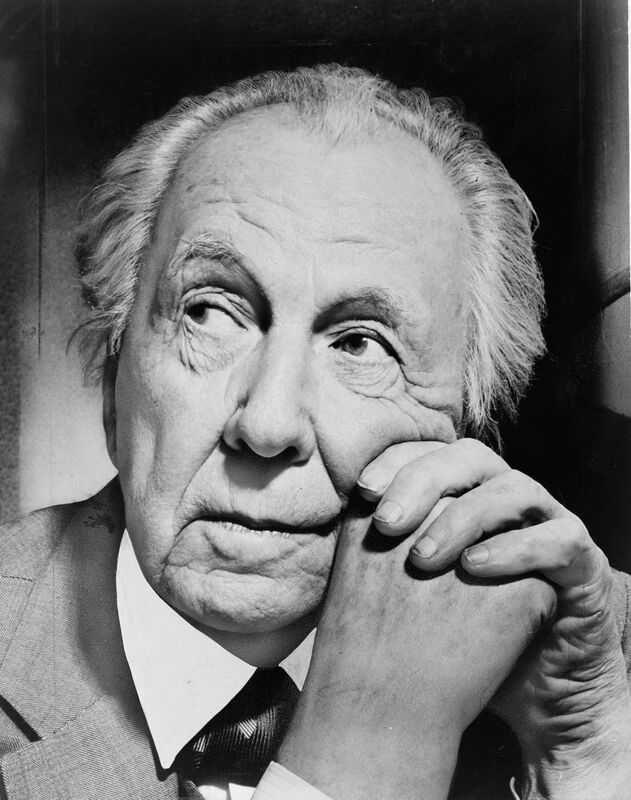 The first drawing of the Frank Lloyd Wright design concept was published in The Kansas City Star on June 13,. 1940. One outstanding feature of the design was the tower of lights which would beam from openings in the roof over the chancel area. The lights, along with bells, were to be above the sounding board that formed the ceiling of the chancel. This sounding board was to be perforated to allow light to streak the cancel area. The steeple lights were still planned as late as December, 1941, projected to consist of eight 1,000 candle power lights which would “probably be used during the holiday season.” However, this feature of Wright’s design was never completed. A 1,200-seat auditorium, sloping to a platform as in a theatre, was an integral part of Wright’s concept. The 46th Street entrance would be designed without steps, an early recognition of the needs of the handicapped. On October 30th, Wright sat in a lengthy conference with city officials, struggling to keep his patience as he listened to the Director of Public Works and the Commissioner of Buildings. The city refused to grant a permit for the building on the grounds that it was too radical to meet the provisions of the city’s building code. 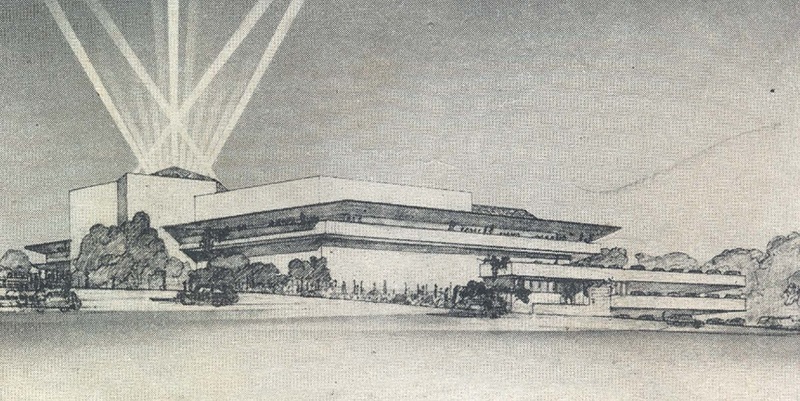 At the end of the conference, Wright was accused of planning to put up a circus tent, a mere shell of a building. Wright’s plans were considered “skimpy” and the city officials insisted on “plans that any good engineer could understand.” Not until a redesigning of the foundation had been accomplished was the way paved for a foundation permit. This compromise utilized concrete foundations instead of the floating foundation originally planned by Wright. Once construction began, the Commissioner of Buildings made daily inspection tours at the site and forced builders to add tons of steel to insure safety.